I don't usually post on the weekend but when something like this comes out, I cant help it. The cost of curbing the soaring emissions of harmful gases that are blamed for causing global warming has been estimated at $1 trillion by a major study of the cost of climate change. The report, byPricewaterhouseCoopers, lays bare the potential damage to the environment of the industrial revolution in China and India. It puts a price of $1 trillion (£526bn) on the cost of sorting out the problem spread over the next generation. The bill is equivalent to a year's output of the economy of Canada, and less than half of the total stock of debt that has been built up by Britain's households. But it is less than the cost in terms of environmental catastrophe and loss of life that scientists fear will happen as temperatures and sea levels rise. "It is implicit from our findings that a trillion dollars certainly is a cost worth incurring," said John Hawksworth, the chief economist at PwC and author of the report. More next week once I have a chance to read up on it. But the king of all fish has proven vulnerable to manmade meddling. Pollution from paper mills, blasting by logging companies, and dams that impede salmon migration helped slice the Penobscot salmon population to 530 in 2000, from nearly 5,000 20 years ago, said Patrick Keliher, executive director of the Maine Atlantic Salmon Commission. Other efforts to restore salmon included restocking fish and tracking them with transponders. An environmental coalition is raising $25 million to buy three dams from a power company, tear down two of them and build a fish bypass around the third. But while the dam project is expected to restore thousands of salmon, it will take years. And with just over 1,000 salmon currently in the Penobscot, Maine’s largest river, Mr. Keliher said, state biologists felt they could allow limited fishing, with the hope of ultimately resurrecting a sport that once drew millions of tourism dollars into Maine’s economy. If we, as environmental economists, believe we have the right approach to environmental policy, wouldn't it make sense that we do a better job of teaching (brainwashing?) young kids the basics of economics. Afterall, someone once said, I believe the children are our future. Teach them well and let them lead the way. 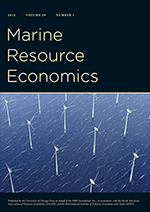 Illge and Schwarze provide an interesting paper to determine the real differences between the research of neoclassical environmental economists and ecological economists. Neoclassical environmental economics favor a goal of weak sustainability (technology will lead to physical capital substituting for natural capital) and tries to be objective. Ecological economists favor a goal of strong sustainability (physical capital can't substitute for natural capital) and don't worry about being objective. The first thing they tell you here is not to play with the gorillas or the elephants. The United States as a whole gets about half its electricity from coal, the most carbon-intense of fuels, and coal generation accounts for more than a third of its greenhouse gas emissions. So if the United States decided to get with the Kyoto program, it could comply just by replacing half its coal-fired plants with proven low-carbon sources like wind, natural gas and nuclear energy. A simple tax on carbon emissions or a national cap-and-trade system could get the job done. No matter what happens, the end message will surely be that there’s no real substitute for concerted national action. Simply put, though California deserves praise for attacking the climate problem head on, it may be trying to do too much on its own. If you see a woodpecker in your tree, cut the tree down (Rare woodpecker ...*). The chain saws started in February, when the federal Fish and Wildlife Service put Boiling Spring Lakes on notice that rapid development threatened to squeeze out the woodpecker. If the value of the preserve (sic) land is greater than the cost (the value of the developed land), then the government should raise the money via taxes, purchase the land and protect the preserved land benefits from development. "Takings" via regulation don't (sic) seem the right approach to me. I like to indent and italicize my own quotes to make them seem more important. Mountain caribou celebrated last week as a judge banned snowmobiles from a nearly 470-square-mile caribou recovery zone in the Idaho Panhandle National Forests. The ban will hold unless the U.S. Forest Service can develop a winter recreation strategy that would enable noisy, polluting vehicles and the last mountain caribou herd in the Lower 48 states to coexist harmoniously, ruled U.S. District Judge Robert H. Whaley. There are about three dozen of the caribou left in the area, with what Whaley called a "precarious finger-hold" on survival (although hoof-hold, we think, would have been more apt). Snowmobile interests blamed logging, backcountry skiing, and climate change for the shrinking herd; conservationists presented evidence that snowmobile noise frightens caribou from feeding and calving grounds, and argued that vehicle trails compact snow, leaving the caribou without deep-snow protection from predators. "The court chooses to be overprotective rather than under-protective," Whaley wrote in his ruling. A 12-foot-long alligator killed by a motorist on a coastal North Carolina highway weighed about 475 pounds, forcing officials to use a large excavator to remove the reptile. The American alligator was about 85 years old when it was struck late Monday night along U.S. 17 in Onslow County, state wildlife officials said. The reptile was removed by state Department of Transportation officials Tuesday. Continuing the previous post, click on the picture to the right to see evidence of the changing premiums on mid and premium grade gasoline. 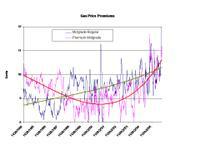 The graph represents the price difference between Premium and Mid-Grade gasoline (dark blue) and the price difference for Mid-Grade and Regular gasoline from 1994-present. The green line is a 3rd-degree polynomial trend for the premium price difference and the red line is the third-degree polynomial trend for the mid-grade price differential. It seems that the price difference for both grades is increasing for about the last three years. All data comes from the EIA Weekly Retail Gasoline and Diesel Price data.